In this review, we battle our way through the racing game Diddy Kong Racing. We find out if this Nintendo DS version is worth replaying. 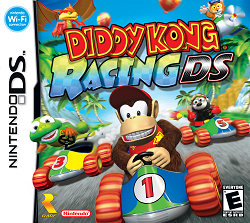 This game was released in 2007 and would be a remake of the original N64 version, Diddy Kong Racing. Since the N64 version got such a high score, we wondered if the DS remake fared as well on the handheld system. Since we’re talking about a remake, this review will focus more on the differences from the N64 version – and there are plenty of differences to be had here. One of the main differences hits right away when you start a new adventure. Instead of that foreboding, yet mysterious intro of the WizPig sculpture on the side of a rockface, you get some characters being chased by WizPig himself. Frantically, the characters write and send a letter via parrot to Diddy Kong, asking for help. Diddy Kong gets the letter, and replies saying that he is willing to help rescue them. The letter gets back to the characters who are, well, still being chased apparently. While Diddy Kong is running to the rescue, Krunch follows out of curiosity. Yeah, forget e-mail or any of the modes of transportation available in the game, parrot is apparently the fastest form of communication around. Even though this game got off to an absurd start, I still had the memories of playing the N64 version. I forged ahead. Once I chose my character (there are differences where some characters were removed while others were added (such as the removal of Banjo and the addition of Trixie Kong), I finally arrive at the island where I immediately get stopped by Taj the Genie. While this happened in the N64 version, Taj seems to be far more into explanations this time around. In fact, you are forced to undergo a driving test right away before entering any domains in the main world. In addition to this, there was an apparent need to load up more stuff at the beginning with Taj’s tent. The tent, once you rub the lamp with your Stylus, reveals a full blown store with vehicle upgrades and other extra’s you can buy with Rare coins. After being bombarded with explanations and tests, I was finally set free to explore the island. Once you finally get let loose, you’ll quickly discover that there are no golden balloons anywhere on the island, waiting to be found. As a result, the outside area is reduced to being little more than a hub for all the other domain hubs. Another disappointment to be sure. The first domain is Dino Domain where the cost of entry is nothing more than a single golden balloon (which you earned with your road test). From here, you get the much more familiar hub that contains access to 4 tracks, the trophy case, the T.T. door, and the boss door. Each door unlocks under certain conditions. Like the original game, the hidden key unlocks the T.T. door, a required set of balloons unlocks the individual tracks, and the boss becomes available once you beat all four of the tracks. This is where things get different. Once you beat the first boss race, you are informed of the balloon challenge. This challenge replaced the sometimes frustrating, but challenging coin challenge. The balloon challenge has, well, nothing to do with racing. Instead, you are automatically flying around on a magic carpet. You need to use the Stylus to pop as many balloons as possible as you fly around the course. You only have one lap to get at least the bronze goal. To make things even more clunky and awkward, you have to drag the Stylus across the screen just to move the camera. Heaven forbid you are forced to look backwards to pop one balloon you missed. By the time you snag that lost balloon and turn around, you probably missed about 5 or 6 other balloons in the process. This is the kind of challenge you would expect as an extra feature you can play later for coins, not something mandated by the game to complete. To make matters even more convoluted, you can’t go back and re-race a track you’ve beaten already until you’ve beaten them all. A new restriction that seems to be there for no other reason than to frustrate the player. Once you have managed to fight the controls enough to pop the minimum number of balloons in each race, you are then allowed to tackle the boss for the second race. Defeating the boss will not only net you a piece of the WizPig amulet, but also allow you to race the trophy race. While the trophy race is generally the same as the N64 version, the difference is that different opponents usually wind up on top in each different race. Mathematically speaking, this makes these trophy races substantially easier because you can just finish second in every race while the points are more or less randomly distributed throughout the rest of the heat. By the time you make it to the end, you have an extremely good chance at winning the trophy while the rest of the competition is left with fighting over the remaining scraps of points. What is new is the addition of the third boss challenge. While some reviews have you believe this is a requirement for your adventure, this third challenge is entirely optional. If you manage to beat the third boss battle, you get a whopping 100 Rare coins. This can make buying those more expensive vehicle upgrades much more affordable and reduce the amount of grinding you need to undergo as you race over and over again for the sake of collecting a dozen or so coins each round. While I could only challenge two bosses, I quickly discovered that these boss races are different. The Dino Domain boss requires you to draw your path on the track with the Stylus and spin the wheel whenever you spin out. Some critics say that this is a convoluted and unplayable mess. I agree with this assessment. After trying this race a couple times, I was more inclined to just call the race off entirely just because the controls were abysmal. Meanwhile, I tried the third boss battle with the giant walrus and found out the challenge was entirely different. Your accelerator is always on and you steer with the D-Pad. The goal is to bust up the obstacles with the stylus as you race through the level. The second you get overtaken, you lose. Still, this challenge proved to be much more well thought out than the Dino Domain boss battle. While the initial domain may be a breeze as far as required races are concerned, you’ll discover that things get more challenging as you make it to other domains. Beating Windmill Planes in Dragon Forest, for instance, is an extremely tall order without vehicle upgrades. So, you’ll end up going back to Taj’s tent for critical upgrades with what coins you’ve managed to collect and grind up. These Rare coins seem to replace the banana’s that used to dot the tracks and enable you to drive faster. Some upgrades cost a mere 25 coins while the other, more worthwhile upgrades, cost as much as 100 coins. While it’s a steep cost, it makes most races winnable with any character. The downside to the shop is the fact that everything is either poorly explained or not explained at all. The special ‘A’ upgrade and the ‘B’ upgrade both cost the same. The difference is looks – an appearance change that you don’t see until after you undergo the upgrade. Nowhere in the shop is this even hinted at, let alone explained. Stat differences would have been nice to see, but that is nowhere to be found. It’s as if this feature was hastily put together at the last minute. Regardless, it was badly implemented. If you are lucky enough (or have prior knowledge), you’ll come across a key. Each domain has a key that unlocks the T.T. door. While some players might remember the innovative egg hatching challenge or the crazy multi-player battles, this feature was taken away and replaced with a race against T.T. In three of the four races, you are confined to drawing within strict parameters. In the fourth and final T.T. challenge, you can draw your own track without the required checkpoints (lots of complex turns in this last challenge will cause T.T. to constantly tumble off the track as T.T. tries to stay in the middle of the track no matter what). Regardless, you get to place the start/finish line and race. Win the domain’s race and earn a piece of the T.T. amulet. This may be one of the best additions in the game. While it was an interesting feature, the original N64 challenges behind these doors completely blows these ones out of the water. While these are some of the big changes, there are lots of small changes to this game as well. If you race over an oil slick, you’ll not only spin out, but also experience a short period of little traction. Not a bad addition to this game. While you can collect three balloons of the same color to get the most powerful normal weapon, collecting a different color balloon won’t cancel your progress. Instead, the balloon merely pops harmlessly and you keep whatever you have before. What is new is the medallion with the up arrow. If you collect this medallion and an balloon, you can upgrade what you have to a special upgrade. An upgraded boost will allow you to have a brief auto-pilot which helps you speed past opponents much like the Autopilot upgrade of the Wipeout series. Meanwhile, the missiles will upgrade to missiles that circle around you and fire at the nearest opponent. The oil slick becomes 5 fake coins. Both of those weapons do resemble what is found in Mario Kart 64. I’m personally indifferent about this new feature in all honesty. Generally speaking, I was hoping little was changed in this game just because the N64 version was so well done. I was worried coming into this game having been already disappointed by Super Mario 64 DS. It seems that my worst fears were realized here. It was like the developers had this overwhelming urge to fix what wasn’t broken. It really showed. Between clunky balloon challenges, ridiculous torch challenges that force you to blow into the microphone, and changes that made me scream “Why Rare, why?”, this game took a fantastic game and mutilated it. Everything that was touched made this game worse and worse off – and I’m far from the only person to say that the extra’s were terrible. The only thing that was good about this game was almost exclusively what was left untouched – the core races and the initial boss races. Unfortunately, with so much garbage dropped in front of you, you now have to wade through the junk play just to get at what little scraps of solid gameplay that remained. In all honesty, it just isn’t worth the trouble. You’re far better off with the original N64 version. Graphically speaking, this game does retain a lot of what made the N64 version great. While the effects and the textures were downsized, there’s still plenty of eye-candy to appreciate. The portraits plastered along the sides of the tracks, though, were just strange. The audio was quite cringe-worthy coming from a player who has played the original N64 version. Virtually every music track found in the game was either downgraded severely or replaced entirely with tracks that were so mediocre, nothing about it was memorable. I’ve heard suggestions that the DS has far superior audio capabilities than the N64. If that is true, then you’d never know it with this game. The N64 version had nice rich music that helped make the game memorable. This version had music you could tolerate, but it was nothing special. Another feature the N64 version had was the great voicework. In this version, that voicework was stripped out almost entirely and replaced with bland voice, smaller bits of voice talent combined with large chunks of text to fill the void. While the smaller bits of sound effects were fine, it was overshadowed by the bland voice talent (Taj being the biggest example). Overall, one thought that came across my mind before playing this game was, “It’s Diddy Kong Racing, how could anyone screw it up?” Well, to my shock, it was successfully wrecked in this “remake”. All the terrible extra’s and features that were added bogged the game down severely, forcing you to wade through with the few scraps of good gameplay that managed to escape the butcher knife. The hatched job was so bad, I couldn’t be bothered to complete this game. Some of the features that were added are mandatory, but have exactly nothing to do with racing (the balloon challenge being the biggest crime here). While the graphics were not that bad, the audio was like nails on chalkboard compared to the N64 version. If you had a choice between the N64 version and the DS version, the N64 version completely leaves the DS remake in the dust. I can’t say I would recommend this game. Furthest point in game: Two balloons shy of bronze in Treasure Caves. Completed the T.T. amulet. Obtained two WizPig amulet pieces and won two trophies before having more than enough.